Osteoporosis is a common type of bone disease that is part of every culture. It hits postmenopausal women the hardest, where 30-50% of them have less bone mass than other women. This condition can lead to falls in more ways than one. It predisposes the vertebrae to spinal fractures, or compression fractures. People who injure themselves with a fall that results in a spinal fracture will be unable to work or get around to perform daily living tasks. The aftermath of a fall can be devastating for the person who suffers from a compression fracture. If you are over the age of 50, especially as a postmenopausal woman, you should take measures to prevent falls so that you are not debilitated for any length of time. Any type of visual impairment. It can be wearing outdated prescription glasses that do not help you see correctly. Bifocals or trifocals can alter your ability to see where you are stepping and can lead to a fall. Medications: Some medications can cause you to be unsteady on your feet or dizzy. Blood pressure pills, heart medicines, water pills, muscle relaxants, and tranquilizers are all to be aware of. Being on many medications can be a risk factor as well. Slow gait. Walking slowly and in a shuffling type of gait can predispose you to a fall. Lack of activity. If you do not regularly exercise or keep active, you will have less balance and more muscle weakness. You will not be able to catch yourself as easily if you happen to trip. Kyphosis: If you have a back that curves in a hump, your center of gravity is altered. This condition can cause the likelihood of falls to rise. Get rid of area rugs: Those lovely Oriental rugs can be your downfall (no pun intended). Give those area rugs away to the Goodwill or to anyone who wants them. Pick up and organize: Get clutter off of the floor and keep it from littering your home of potential trip hazards. Secure the loose ends: There are cords and wires from technological equipment all around the house that can cause you to get tangled up and fall. Bundle them up and securely tie them. Have a nightlight or flashlight handy: If you get up during the night, you should use a flashlight or have a nightlight illuminating your path. Stair rails should be secured, and stairs should be well lit. 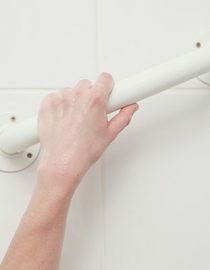 Install grab bars: They can be placed in bathrooms near the toilet and also inside the tub/shower area. Wear rubber-soled shoes. They have the best support and better traction so you do not slip. Be careful of stepladders. They are not safe unless you have someone nearby while you are using it. If you can avoid them all together, the better. When you are carrying something, make sure you can see the path in front of you. The best thing to do for yourself is to exercise and take in an adequate amount of calcium and vitamin D every day. Do exercises that strengthen your muscles and improve your balance regularly. Also, see if your doctor will do a bone mineral density test on you. If you or a loved one has been recently diagnosed with osteoporosis – you may be wondering, is osteoporosis hereditary and what can I do to prevent it?